In mid-May, I sent in two pairs of pants to MRC Cleaners in Cedar Knolls, NJ (via their convenient home pickup and delivery service) to be dry cleaned. 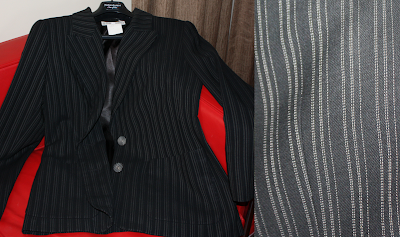 My favorite pair of pants matches the jacket in the photo: black pin-striped ladies’ Yves Saint Laurent, originally European size 42, but tailored to a smaller fit. The other missing pants are plain navy, women’s size 10, either Donna Karan/DKNY or Dana Buchman. Please check your closets and recent dry cleaning orders. If my pants turned up in your dry cleaning order by mistake, please contact MRC Cleaners at (973) 267-4430. I’m sending in a few hundred of these fliers to MRC Cleaners tomorrow, along with my most recent laundry and dry cleaning order, with the hope that management will distribute them to all of their customers…. we’ll hope to have a happy ending to post soon. Awesome News! MRC Cleaners Found My Pants!